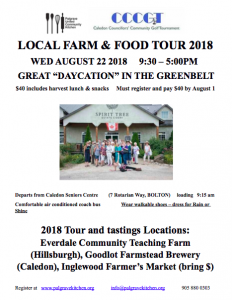 The Palgrave United Community Kitchen invites you to spend a day touring and tasting the local harvest in Caledon and the Headwaters area at a Local Farm & Food Tour on Wednesday, August 22. The tour will visit Everdale Community Teaching Farm (Hillsburgh), Goodlot Farmstead Brewery (Caledon), and the Inglewood Farmers’ Market. The all-inclusive tour costs $40 and includes snacks and a local harvest lunch. There will also be tasting and learning on the air-conditioned coach bus. Attendees are encouraged to bring along some cash to buy produce at the Inglewood Farmers’ Market. The tour will depart from the Caledon Seniors’ Centre at 9:30 a.m. and will return by 5 p.m. The event is rain or shine. Bring shoes suitable for walking outside on farm lanes. To reserve your seat by August 1, contact payment@palgravekitchen.org.